If Ireland's geography leaves you feeling a little lost, this short 'lesson' should bring you up to speed. It isn't intended to be an in-depth study on the subject, just some basic information to help you start to get to know the island where your ancestors once lived. The island from which your ancestors originated is situated on the north-eastern fringe of the Atlantic and on the north-western edge of Europe. It occupies a total area of approximately 84,409 square km/ 32,599 square miles. The Republic of Ireland measures 70,273 square km/27,132 square miles while the six counties that today make up Northern Ireland measure about 14,136 square km/5,467 square miles. Its greatest length crosses from Toor Head, Co. Antrim, in the north (which, in the 1800s, was an important headland used for recording the passage of transatlantic ships and relaying the information back to Lloyds of London) to Mizen Head, Co. Cork, in the south. The distance covered is 486km/302 miles. Its greatest breadth crosses from Dundrum Head, Co. Down, to Annagh Head, Co. Mayo, a distance of 167km/104 miles. The longest river is the Shannon which cuts through 386km (240 miles) of the low lying Midlands region before pouring into the Atlantic at Limerick. The total length of the island's coastline is 3,172 km (1,970 miles). The largest lake is Lough Neagh, which is 396km²/153 miles² in area. Among the island's natural resources are zinc, lead, natural gas, copper, gypsum, limestone, granite, peat, silver and gold. The map above, and the edited versions which are downloadable below, are taken from The Great Hunger, by Cecil Woodham-Smith. This outstanding book is the definitive work on the dreadful famine of the late 1840s which claimed so many lives and impacted so much on the Irish character and on Anglo-Irish relations. It isn't necessarily the easiest book to read  the author is unrelentingly in detail and unjudgemental in the telling of a terrible story  but if you ever wanted to know what really happened in those awful years, this is the book to read. Now published in Penquin paperback, it is easily available in bookshops or through online book outlets. Province of Connaught: Galway, Leitrim, Mayo, Roscommon and Sligo. Province of Leinster: Carlow, Dublin, Kildare, Kilkenny, Laois, Longford, Louth, Meath, Offaly (previously known as King's Co), Westmeath, Wexford and Wicklow. Province of Munster: Clare, Cork, Kerry, Limerick, Tipperary and Waterford. Province of Ulster:Cavan, Donegal and Monaghan are in the Republic of Ireland; Antrim, Armagh, Down, Fermanagh, Derry and Tyrone are in Northern Ireland, a part of the UK. You can find out more about the 32 counties, in alphabetical order, on these four pages: Antrim-Down, Fermanagh-Louth, Mayo-Sligo and Tipperary-Wexford. These pages will give you a little extra social and historical information about each individual county. Maps, for both the counties and regions can be accessed in the links at the bottom of the page. The main towns of Ireland, historically, were Dublin and Cork. Belfast grew significantly in the 19th century. In the Republic, Galway, Limerick and Waterford have all become major cities during the course of the last 100 years or so. 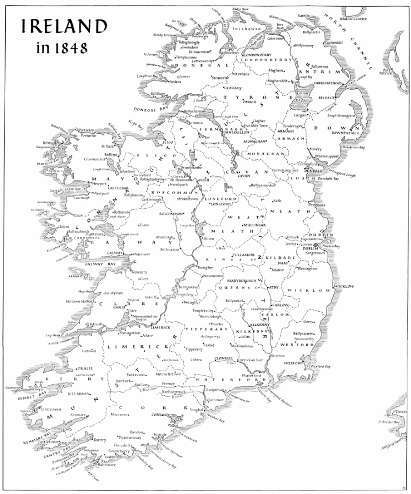 Ports: During the 19th century, when many Irish people left Ireland either due to famine or lack of opportunity, there were any number of departure points dotted around the coast. Some small boats could set sail from harbours that usually saw only fish being landed. Large boats had to use the main cargo ports. These were Queenstown (now Cobh) in Co. Cork, Belfast, and Dublin. More about Irish emigration. Even the briefest look at Ireland's geography has to consider the climate because it impacts dramatically on the soil, the culture and the personality of the Irish people. Ireland is in the Temperate zone which means that is mild all year round. It is, to put it mildly, a moist kind of place. Average annual rainfall is 750mm (30 inches) in some Eastern counties rising to 1500mm (59 inches) in some western areas. Mountainous areas receive even more. The 'wet stuff' has long been referred to as 'soft' weather. As the old storyteller says: if you can see the top of the mountain, it's about to rain. If you can't see the top of the mountain, it's already raining. The coldest months are usually January and February when average daytime temperatures might be 4-7 degrees Celsius. The warmest months are July and August when average temperatures are 14-16 degrees. A county map of Ireland. Download a Northern Ireland map. Find out how to get started with tracing your Irish Roots. 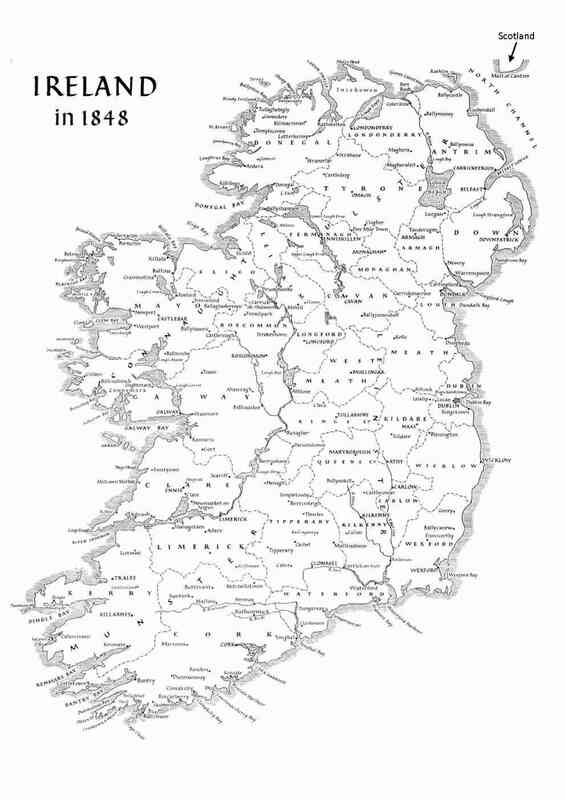 Back to A–Z or go to Irish Genealogy Toolkit Home.